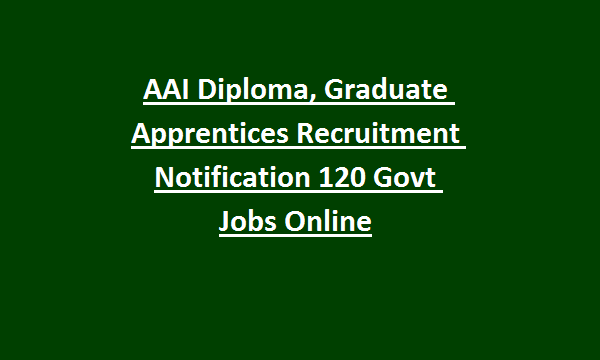 Air Port Authority of India Apprentices Recruitment 2019: Application forms are invited by Air Port Authority of India (AAI) from the candidates, with following Educational Qualification for engagement as Apprentices in the Disciplines of Graduate, ITI, Diploma. Period of Apprenticeship Training is one year (12 months). As per requirement, total available Jobs are 120. Mode of Application is Online. Aspirants meeting the above prescribed eligibility conditions may visit AAI official website i.e. www.aai.aero and apply on-line. Only online mode of application forms will be accepted. Starting Date for Online Registration process is 02-2-2019. Last Date for Online Registration process is 17-02-2019. 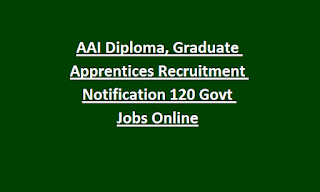 All details of AAI Diploma, Graduate, ITI Apprentices Recruitment Notification 120 Govt Jobs Online mentioned below. As per requirement of Air Port Authority of India (AAI), total available Jobs are 120. 1. Science Graduate with MBA or Engineering Graduate is the Qualification for Graduate Operations Management Apprentices. 2. Diploma in relevant discipline for Diploma Civil Engineering, Diploma Electrical Engineering Apprentices, Diploma Fire Engineering, Diploma CNS Engineering Apprentices. 3. B.E./B.Tech. in relevant discipline for remaining Jobs. 18 years to 26 years as on 31st March, 2019. 5 years relaxation is there in upper age limit for SC,ST candidates; 3 years for OBC. 1. Rs.6000/- per month for Diploma CNS Engineering, Diploma Fire, Diploma Electrical Engineering Apprentices. 2. Rs.7000/- for remaining Apprentices. Aspirants will be selected for these Jobs based on percentage of marks scored in the qualifying exam. Candidates should take certificate of medical fitness from a Gazetted Government Medical Officer. Official website @www.aai.aero and apply on-line from 17-02-2019. Only online mode of application forms will be accepted. Last Date for Online Registration process is 30th November, 2016.